As many of you know, after a nationwide search for the country's top bakers, I was chosen to compete on the season 1 series premiere of the Food Network show "Cupcake Wars", in June 2010. And guess what? I WON! And, I was chosen to come back and compete for the title of "best of the best" on a special Cupcake Wars Champions episode, in Dec. 2011 for season 2 ! 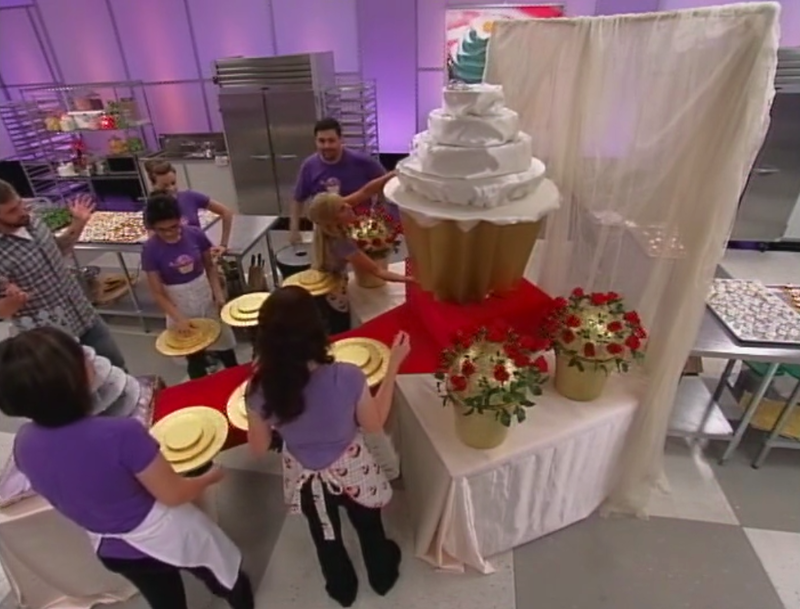 Watch me compete in the season 2, Cupcake Wars Special: Battle of the Champions ("Rose Parade" Season 2 Episode 6)! 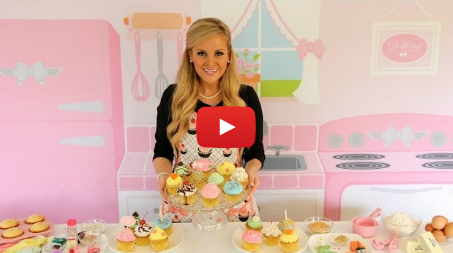 Cupcake Wars Series Premiere ("Seaworld Birthday Bash" Season 1 episode 2)! After winning the series premiere episode I was a lot more calm and collected, going back to compete for "best of the best". This was my second Food Network appearance and just as exciting as the first! Here is a photo of my assistant Jordan and I just before filming! It was sooo early! Round 1 was the "Taste Challenge" and the secret ingredients we had to incorporate into our cupcakes were... 3 ITEMS FOUND ON A ROSE PARADE FLOAT (ONION SEED, WHEAT GRASS, PARSLEY, OATS, POPPY SEEDS, RAISINS, WHITE BEANS, ETC.)! The 3 ingredients I ended up choosing were: parsley, white poppy seed and flax seed. I chose these because I though that if I started with a lemon buttermilk cake, the lemon could act as a nice ingredient to tie the poppy seeds and parsley together, since they both pair nicely with lemon. And, that they did! 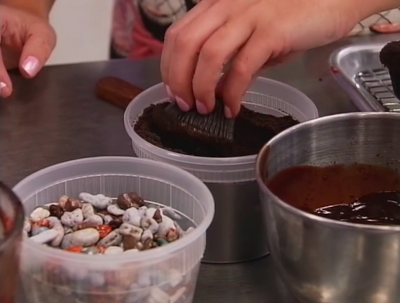 Since this was the champions episode, I definitely made sure to go with unique and risky ingredients! I wanted to make sure I was not going to get sent home for playing it safe with the more typical cupcake ingredients. For the frosting I didn't want to do any plain old buttercream frosting, so I decided to do a GOAT CHEESE frosting and let the tang of the frosting match the tang of the cake... and let me tell you, it was AMAZING! I know it may sound gross, but the hint of goat cheese mixed with some creamy cream cheese, sweet powdered sugar and an added touch of honey and nutty ground flax meal, it was so decadent. One of the judges even told me how much she loved it and could "eat it by the spoonful"! I topped it with a piece of homemade honey flax poppy brittle to tie the flavors all together. I will definitely have to post the recipes for it because it is sooo good. It reminds me of those sesame honey candies, but so simple to make and absolutely delicious! Round 2 was 50% based on taste, and 50% based on presentation. We had to come up with 3 additional cupcake flavors and decorate them to match the theme of the Rose Parade's Queen Coronation. I made sure to incorporate flavor combinations that would match perfectly to the decor of the cupcakes to encompass all of the elements of the Rose Parade and Rose Queen Coronation. Here we are working on the decorations! The first cupcake flavor I chose to make was a Red Velvet Cupcake with Vanilla Rose Water Cream Cheese Frosting. I thought adding rose water to my frosting, on top of a moist red velvet cake, would be the perfect flavor addition to reflect the theme, as well as a great way to incorporate the rose from the Rose Parade logo as my decor! The second cupcake I did was to represent the Rose Parade Queen Coronation event, so I wanted to do a feminine, light cupcake. I ended up using my basic vanilla cupcake recipe as a base and added some lavender and ginger for a wonderful fragrant touch. I paired them with my vanilla cream cheese frosting, flavored with honey to really tie all the flavors together. 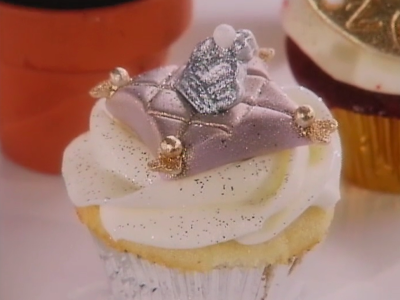 Fittingly, I topped them with a fondant crown adorned with an edible pearl on top of a handmade fondant pillow, to be presented for the queen. My third cupcake was inspired by round one. 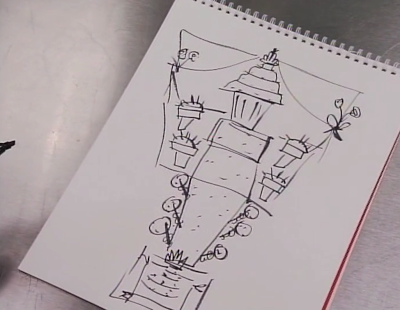 I wanted to create something that would capture the essence of the Rose Parade by showcasing a sprouting plant from the ground, since that is what is used to create all of the Rose Parade floats. I ended up making my moist chocolate cupcake recipe and filling it with a raspberry filling. Then I dipped it in a rich chocolate ganache that I infused with fresh mint leaves and decorating it to look like a plant! I achieved this look by dipping my cupcake in the ganache and then rolling it in crushed chocolate cookie crumbs. 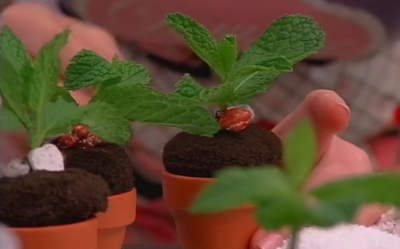 I then placed my cupcake in a mini flower pot and topped it with edible rocks and a sprig of fresh mint. They turned out so beautiful! They almost look like real mini plants, don't they?! Here we are with just seconds left on the clock, making sure the plated cupcakes are perfect for the judges! 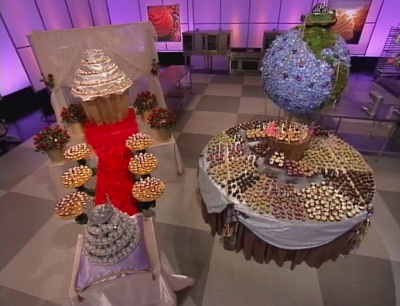 The judges loved the cupcakes and finished every single one! Here is a quote from Candace Nelson, Founder of Sprinkles Cupcakes/Cupcake Wars Judge "Lindsay created a trio fit for a queen and I dubbed her the master of detail. 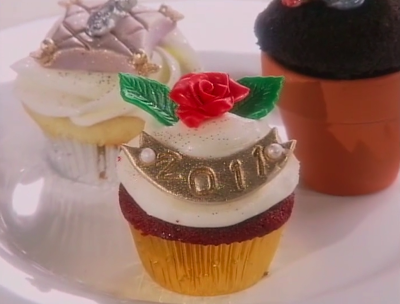 Her fondant decorations were gorgeous and her flower pot cupcake was ingenious. Florian and I were also both impressed at how well the rose water frosting paired with her red velvet cupcake." I was so beyond excited to have made it to round 3! In the last round I had to bake 1,000 cupcakes and create a display for the Rose Parade Queen's Coronation! Here I am in action. See the judges in the background?! Frosting hundreds and hundreds of cupcakes in record time! The ovens were in constant use for sooo long. Here I am talking to the carpenter, explaining what I wanted for my display and exactly how I wanted it to look. Here is a close up of my (very) quick sketch of my display, as I explained every square inch in detail. 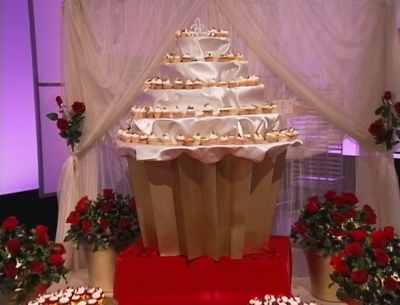 Putting together the finishing touches of my display as I adjust the cupcake tower made to look like a giant "cupcake queen" on her pedestal. I decided to replace the mini flower pot cupcakes with giant ones so I could create a "cupcake bouquet"! The cupcake bouquet look was created by sticking my chocolate cupcakes with the mint sprigs onto a coved ball of styrofoam using toothpicks. I had fabric leaves and roses added to the styrofoam ball too, to give the bouquet some life and color. Here I am adding sticking the first few cupcakes on to the toothpicks, filing in the empty spaces. I had each flavor of cupcake separated on different parts of my display. Here is my "cupcake queen" on her pedestal, with my round 1 cupcakes with my chocolate cupcakes in the faux flower bouquets around it. 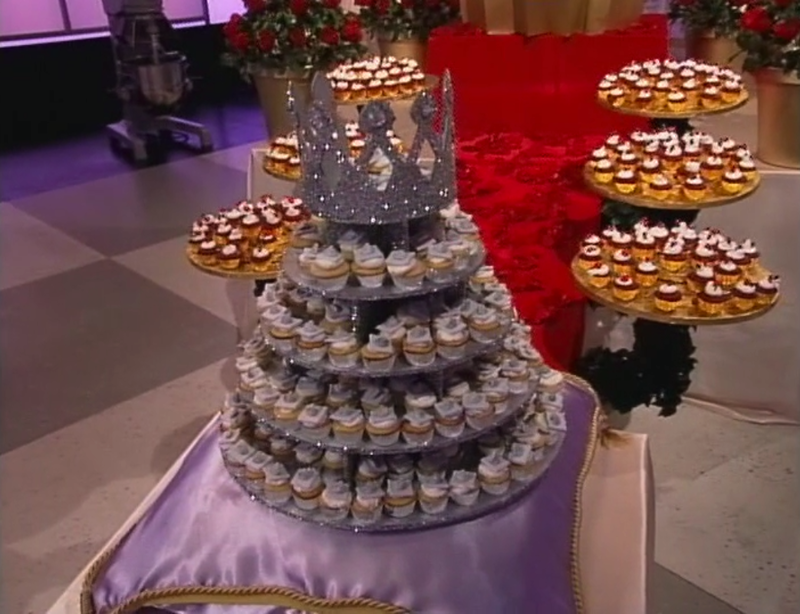 I replicated my decor from my lavender ginger honey cupcakes, with the silver crown on the purple pillow, to create a giant cupcake tower to match, for a fun presentation. The red velvet rose cupcakes were placed on gold pedestals, held up by leafy vines, leading to a red carpet covered in fresh rose petals! Here are the judges checking out my cupcakes and display! Thanks to everyone who tuned in and cheered me on and to everyone for coming to check out my blog! I appreciate all of the support and sweet emails so much! YOU are the reason I do this, so thank you for your inspiration and continued encouragement!!!! 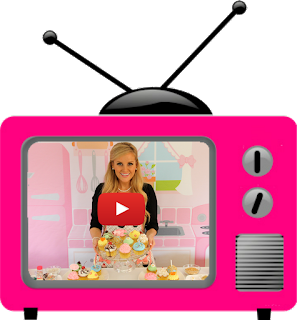 for cupcake recipes, decorating tutorials, baking tips and more!